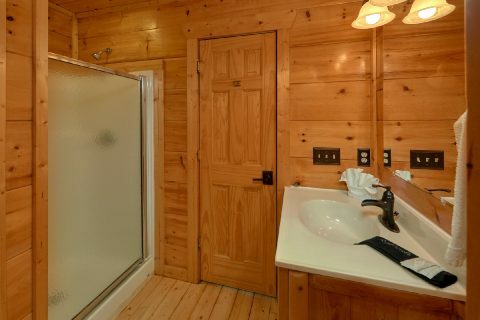 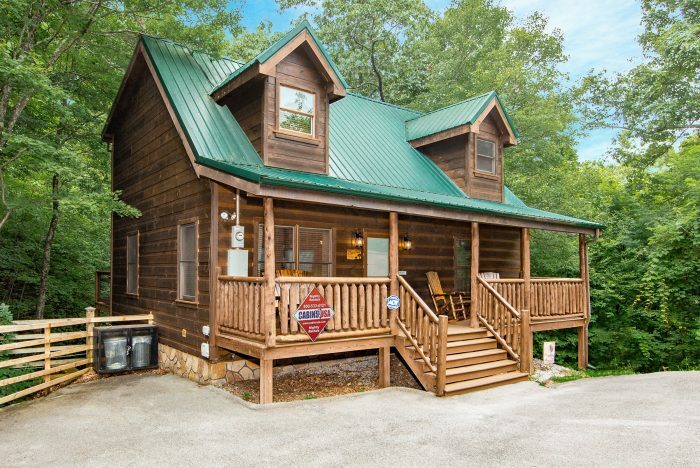 Looking for a comfortable Smoky Mountain cabin with everything you need to unwind? 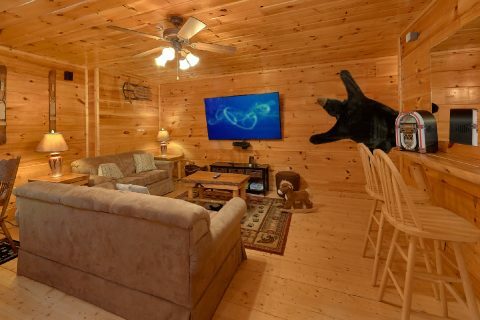 Come experience "A Bear's View!" 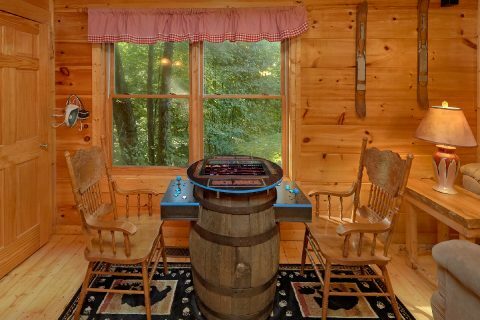 This lovely 2 bedroom cabin rental rests in the Sky Harbor Resort area of the Smokies and it even features a fully-stocked game room with a foosball table for your enjoyment! 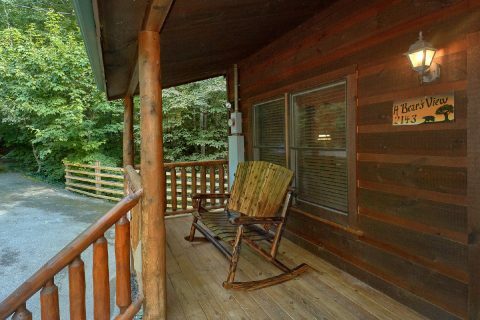 With a prime location a short drive off of the Pigeon Forge/Gatlinburg Spur Road, this cabin rental boasts a prime location for exploring the attractions of the Pigeon Forge Parkway or Downtown Gatlinburg. As a result, guests staying at this cabin will enjoy quick access to top local attractions like Dollywood, Anakeesta Gatlinburg, the Historic Arts & Crafts Loop, and the Great Smoky Mountains National Park! 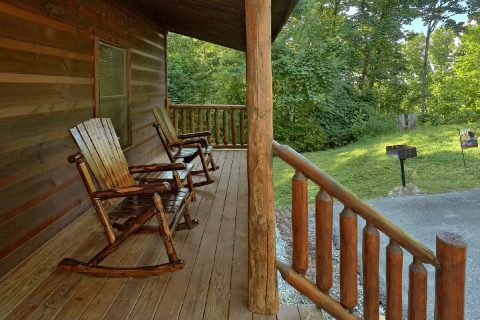 After an excellent day spent exploring the Smoky Mountains, you'll love returning to your cozy cabin to relax. 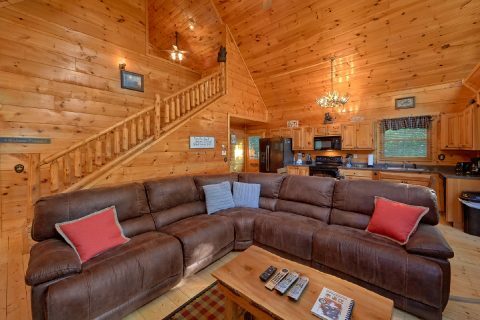 The main level is home to an open-concept floor plan that's ideal for spending time with friends and family. 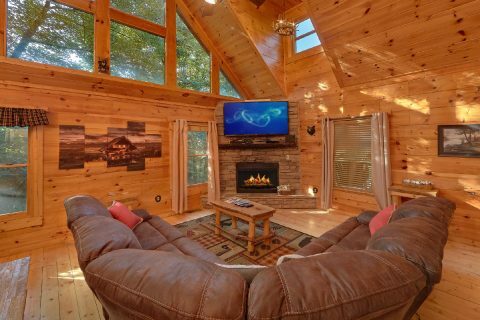 The main living area features high ceilings, large picture windows, a 65" television, and a cozy fireplace to enjoy during the winter-months. 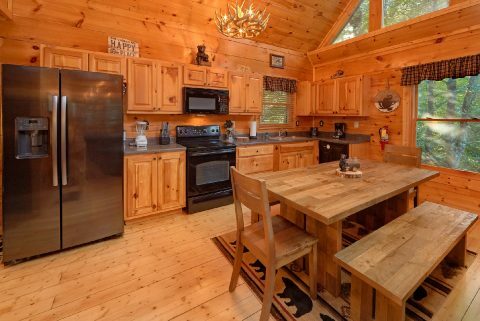 Nearby, you'll find a fully-equipped kitchen and dining area for making delicious meals during your getaway. 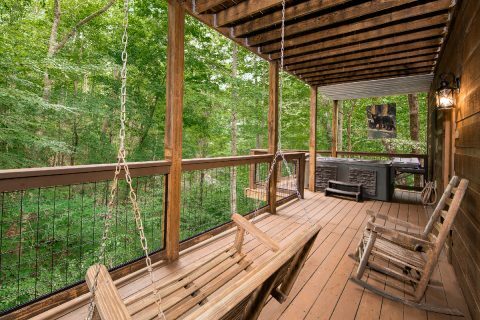 To enjoy your cabin's lovely forested location, you can always step out onto the upper deck. 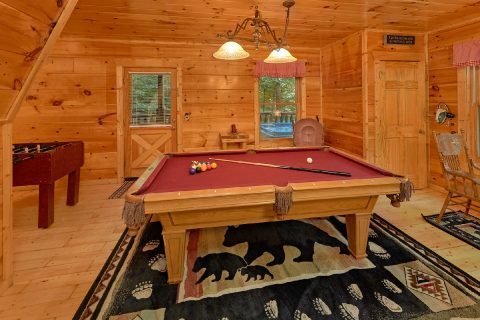 For some in-cabin entertainment, head downstairs to your rental's fully-equipped game room that comes complete with a pool table, Poker table, a table top multi-game arcade game with 60 classic games, a foosball game, and a 75" television! 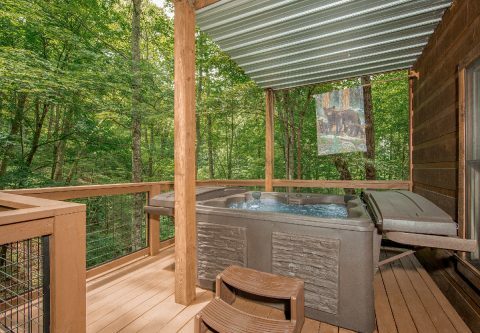 From here, you can step outside to your cabin's lower deck to sit back in the warm waters of the hot tub while you enjoy your cabin's forested scenery. 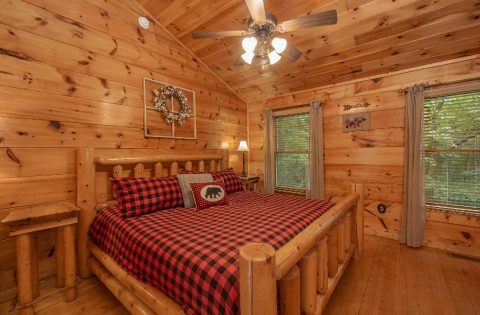 Once it's time to get some rest before your next day's adventures, you can get a great night's sleep in one of your cabin's two bedrooms! 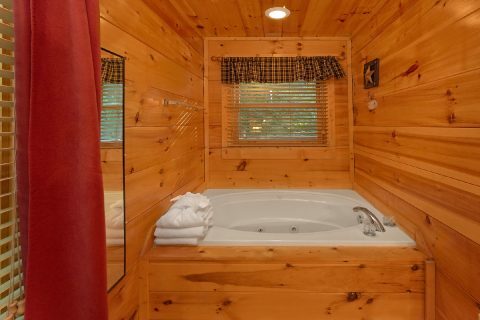 The main floor is home to a king-size bedroom complete with an in-room jacuzzi tub and a flat-screen television. 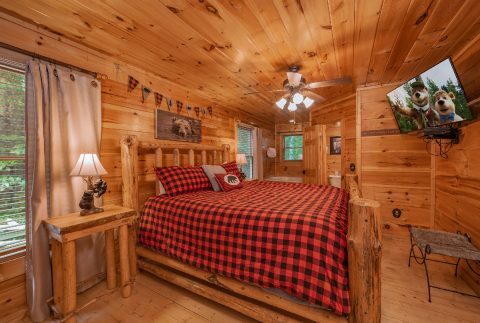 In the upstairs loft, you'll find another king-size bed with a television and a private bathroom. 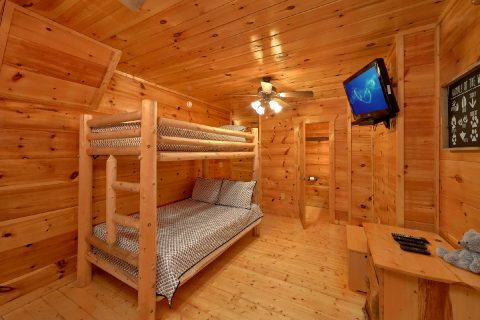 Lastly, the lower level game room is home to a twin bunk bed. 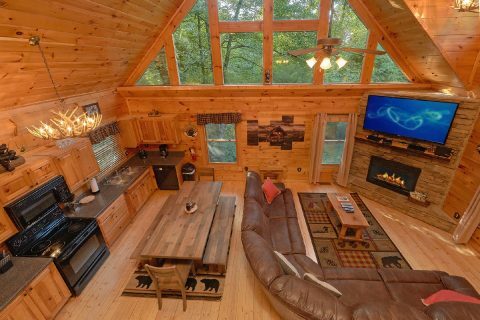 With a sleeper sofa for extra guests, this cabin can easily accommodate up to 8 guests in comfort! 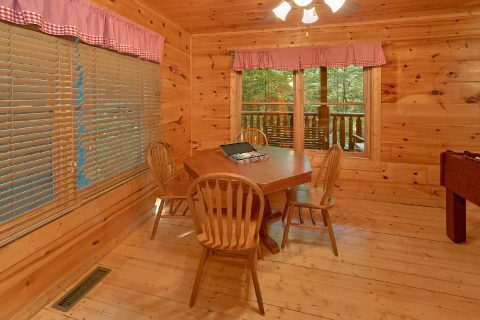 This cabin also provides WiFi Internet access, so you can share beautiful pictures of your trip with friends and family back home! 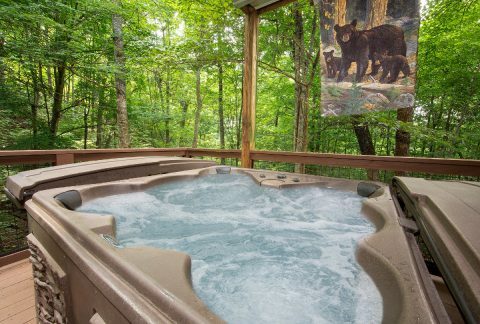 Book "A Bear's View" today with Cabins USA and you'll save 15% on your nightly rate in the Smokies with our special discount!